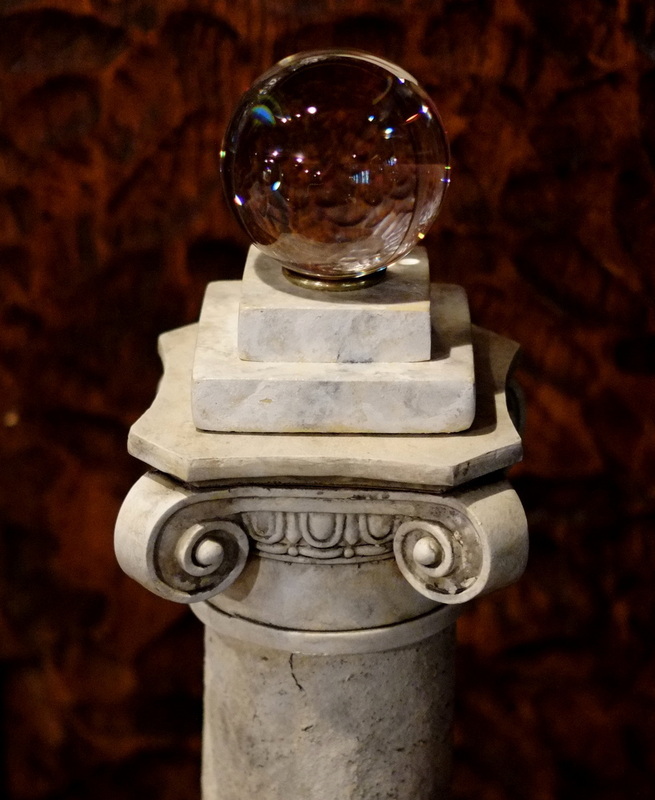 Pop Haydn's "Sphere of Destiny"
The Sphere of Destiny is an approximately 10 pound, highly-polished sphere of flawless, natural quartz crystal. It has a diameter slightly more than five inches. There are only a few flawless quartz crystals of this size existing in the world, but it is it's singular history that gives this ancient object such great value. There is a documented provenance dating it back to the 13th Century, when it was first smuggled out of Acre with the fall of the Knights Templars there in 1291. In the Templar's histories the Sphere of Destiny is said to have been carved from a powerful seer's stone--one reputed to be the original Eye of Cleopatra. Cleopatra's famous "Eye"was a large rough quartz stone that had been ground and polished as smooth as glass on one of its upper surfaces. Staring into the dark depths of the crystal was supposed to reveal images of both the past and future. Cleopatra is said to have first seen the face of Mark Anthony in this stone. The Eye was considered ancient even in the time of Cleopatra--a relic from a period long before written history. It had somehow come into the possession of the Knights Templars during the mid-13th Century, C.E. at a time when the order was on it's ascendancy and extremely wealthy, collecting objects of power and art from all over the East. The Templars had the more than 25 pound stone carved into a perfect sphere and polished. The crystal ball that was created was flawless and fantastically clear. The Sphere of Destiny was captured from the Templars by the Mamluks in 1302, at a battle on the island of Arwad. It was soon after purchased by a rich occultist in Egypt, and has been held in various known but private hands since that time. Passed from seer to seer over hundreds of years, it has been used to record some of the most accurate prophecies ever documented. The theft of the Sphere, and it's quick recovery by private French detectives in 1885 is a famous story of both criminals using advanced technological methods and the new scientific detective work, and was an influence on the writings of Sir Arthur Conan Doyle, the creator of Sherlock Holmes. The Sphere is currently in a private collection in Istanbul, in a residence near Gülhane Park, and in 2001 it was the subject of a BBC documentary, Cleopatra and the Stone of Destiny. The best source of information on this subject is the more than 600 page Cleopatra's Eye--the True Stone of Power by famous crypto-archaeologist Dr. Benjamin Zine. The actual Eye of Cleopatra, or Sphere of Destiny does not reside at the Conlin family private gallery in Istanbul, Turkey as claimed by the Conlin estate, Sotheby's and others. This isn't true at all. 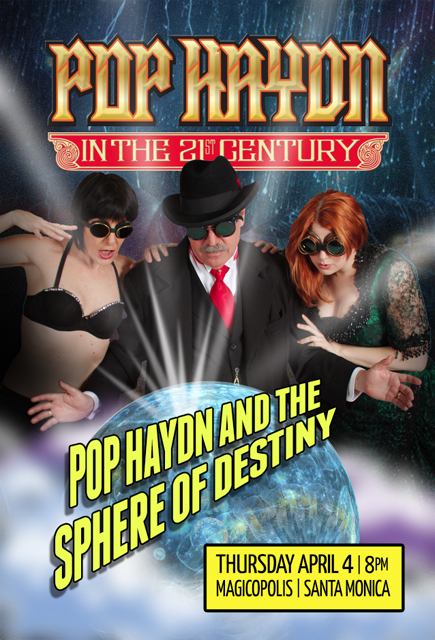 The Sphere of Destiny is safely in the hands of Pop Haydn, and has been since the 1880's. The story of the theft in Cairo has been wrongly reported for over 120 years, and it isn't hard to prove. There hasn't been a confirmed reading from the so-called "Sphere of Destiny" in the Conlin family's collection for over 100 years. The identical, flawless natural quartz crystal in my possession spits out accurate and verifiable information like a Magic 8-Ball. I know the whole story. I was there. I hope one day I will have the chance to tell it and get the story straight for history--who committed the crime, how they duped the British Colonial and French detectives investigating the crime, and how they were able to install a forgery in the private museum in Cairo. Luckily, the authorities are convinced that the actual stone is in Istanbul, where it has supposedly been held since 1890. The stone I have under my protection is identical in every respect, save one. It actually can accurately see at great distances, reveal all hidden information, and can gull its owner with intelligence from the psychic realm. It is much too dangerous to let fall into the hands of those with impure impulses. 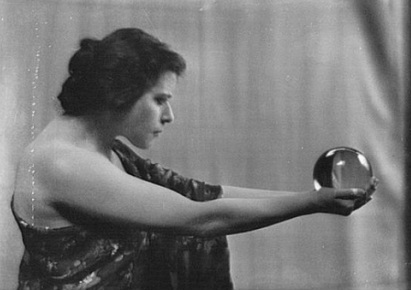 The Eye of Cleopatra -- Theda Bara 1917, "Cleopatra"
There are many references to the Sphere of Destiny in popular culture from 1890's to the mid-twenties, partially as a result of the famous theft and recovery, and then it seemed to just fade from popular consciousness. Cleopatra is often seen in plays and film of that era staring into a crystal ball, even though those would be quite anachronistic to the Ptolemaic period. It is obvious that these are allusions to the Eye of Cleopatra--allusions made not knowing that in her time the stone would have just been a block of raw quartz with a single polished facet. This misconception is compounded by all the literary, stage and film references spawned by the story of Cleopatra's Eye. Only those who follow the occult and are aware of the existence of the famous line of seers who have protected the Sphere of Destiny over the centuries know this true history. --Frank Morgan as Professor Marvel in "The Wizard of Oz." In the same way, there are numbers of medieval references to the Templar's "Sphere of Destiny" that describe it as a highly polished metal or golden sphere with powers different from those associated with a seer's stone. These descriptions were probably based on woodcuts and line drawings from Templar sources and popular histories, and not from direct knowledge. The ability to cut and shape crystals into spheres was fairly new in the Crusader period, and would have been not very well known by the writers of that period and immediately following. A sphere shaped from metal would be much more believable and apprehensible. Magick writers have brought this false idea into many modern tales and fancies. "The Sphere of Destiny is a fabled relic, spoken of in ancient legend. Although little is known about it, it is said to be a small metal sphere which has the power to grant its owner nearly any desire. Of the few stories know about the Sphere, the latest is from a thousand years ago, when an evil necromancer named Terdeth Kyynn stole the Sphere from its rightful owner and took it with him to his ship, a mighty dreadnought. He tried to break the Sphere's power and force it to serve him forever, but the Sphere resisted him, destroying him and everyone else on board his ship. Kyynn's dreadnought, the Necromancer, is said to have drifted endlessly through space ever since, a derelict ghost ship, with the Sphere of Destiny still on board."